‘’Stirnelės viensėdis’’ Farmstead is a Rural Tourism Homestead, located in an extremely Picturesque spot in Lithuania – Labanoras Regional Park. It covers 10 hectares of territory. This is a great place for a family holiday with children. Homestead,- everything to Your relaxation. 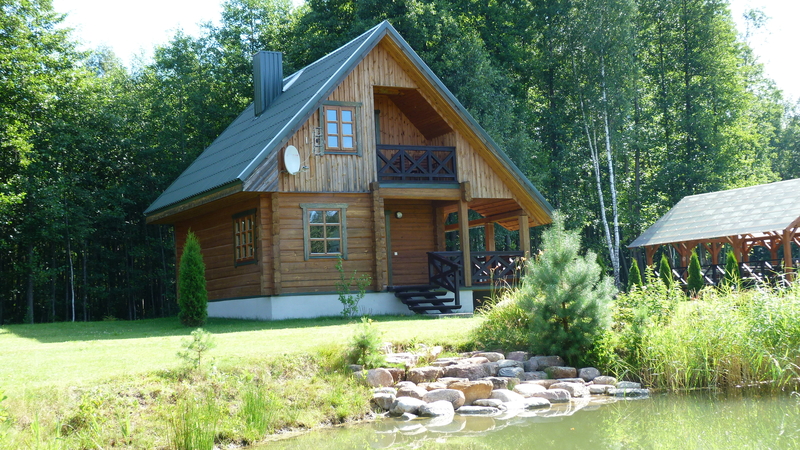 We offer 3 log cabins 55 m2 wide each, with all the amenities, to 4 -6 People ( each ) for the quests to relax. There is a living room , a kitchen, a Bathroom on the first floor and 2 bedrooms ( double and triple ) with a small balcony on the sekond floor. You can dine on the spacious terrace in it. The homestead also has a single ( one ) 150 m2 cottage. This house has a spacious living room, a kitchen, a sauna, 2 bathrooms and 4 bedrooms on the second floor, where you can comfortably seat 10 – 12 people. There is a large covered arbour nearby. The entire homestead for private relaxation with friends and relatives can be ordered. You can go canoeing in a two-seat canoe, take a walk along the paths in the forest or go cycling (there are bicycles with special seats for children). Also, you can enjoy swimming in the lakes next to the pathways. There is a children’s playground, you can play basketball or volleyball. For the fishers, barriers or mushrooms – the place is especially suitable. For those who want to rest quietly – we offer to relax in the sauna, have a barbecue and sit by the fire. Good conditions for quests to make their own meals. The kitchens have all the equipment you need – a fridge, a cooker, dishes and a lot more. Breakfast, supper can be ordered. The hostess will make them delicious and Inexpensive food. There is also a possibility to have lunch or dinner in the nearby village of Labanoras ( 8 km. ) or Mindūnai (5 km. ) cafes. To the nearest shop – 5km ., to the supermarket – 15km. Those who want to rent a car are welcome and can travel around the area.